The New York Daily News is reporting that a video of pop star Katy Perry singing a spoof of her hit “Hot N Cold” with Elmo (performed by Kevin Clash) has been deemed “too racy” and subsequently pulled from Sesame Street‘s official YouTube Channel. 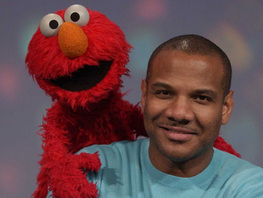 Kevin Clash with Elmo. Image courtesy SesameStreet.org. In light of the feedback we’ve received on the Katy Perry music video which was released on You Tube only, we have decided we will not air the segment on the television broadcast of Sesame Street, which is aimed at preschoolers. Katy Perry fans will still be able to view the video on You Tube. We will not be linking directly to any video here on the blog (just to avoid potential broken links); however, dozens of YouTubers are (naturally) scrambling to get traffic off the controversy and publicity. Just do a YouTube.com search for: Katy Perry Elmo and you’re sure to find it. In a bit of ironically related news, The Hollywood Reporter has an exclusive preview video from Sesame Street’s upcoming 41st season with a parody of the very adult, violent and graphic HBO series True Blood. Sesame Street (and Jim Henson productions in general) has never shied from spoofing pop culture even at the risk of alienating their core demographic from the joke. But like the subtle (and sometimes not-so-subtle) innuendo in classic Looney Tunes cartoons, there are some gags and references on Sesame Street that parents will laugh at but kids won’t understand until adulthood. The National Academy of Television Arts & Sciences has announced the nominees for the 37th Annual Daytime Entertainment Emmy® Awards. Some of Seasame Street‘s Muppet performers were also included in nominations for “Outstanding Directing in a Children’s Series”: Kevin Clash, Matt Vogel and Joey Mazzarino, and Mazzarino was also included in a nomination for “Outstanding Writing in a Children’s Series” (he serves as the head writer for Sesame Street). “The Daytime Entertainment Emmy® Awards” are scheduled to air on CBS June 27th, 2010. You can view the full list of nominees via EmmyOnline.org. The following message was sent out through the Samantha Newark Mailing List. Samantha, whom fans know as the voice of Jem from JEM! and the Holgrams, is also a Nashville resident. I was fortunate, myself and my loved ones managed to escape damage at my house but I feel like I’m on an island and there is devastation all around me. Two of the people that drowned were found right where I buy my groceries about 3 miles from my home. Hard to believe there were cars upside down floating in the intersection there on Sunday. They still have no power in that area. The following is a letter that was forwarded to me from a friend in the music community. Here he shares the scope of this mega flood and also ways you can help your fellow neighbors in Nashville. Since I hadn’t heard from many of my friends in LA since this happened I started to realize that the news coverage had been very sporadic so I’m doing my part to assist in a little way and get the word out to my fans. The devastation is so widespread, it’s unbelievable. You would probably have to submerge my entire home state of NJ in water to cover as much area as this flood has covered in TN. While a few of these areas are flood prone, the majority are not and a large portion of the people affected do not have flood insurance. Just to give you a better picture of my little world, I could easily draw a one-hour radius from my house and barely scratch the surface of people affected. Across the road from our development, one of our daughter’s elementary school teachers lost everything in the flood. Just up the street at the Fieldstone Farms development, they were rescuing people in boats – one house in Fieldstone caught fire and blew up. Drive south for about 30 minutes, you would get to my friend Dale and Carol’s farm which is home to the annual Blackberry Jam Festival where Michael McDonald played a couple years ago. Their entire first floor of their house was submerged in water. It took a group of four of us about 3 hours just to clean the mud out of one bathroom in their house. Drive west about 40 minutes and you’ll get to Bellevue, an area I lived in when I first moved to Nashville. Entire neighborhoods are underwater. Our friend Gary and Robin’s house managed to escape with about a foot of water, but the rest of their cul-de-sac was submerged. Cars were floating upside down on the road in front of the nearby Belle Meade Kroger. Two people died when their car turned over. Two others drowned behind the Belle Meade Kroger. Head northeast about 40 minutes to Hermitage and you’d get to my friend Denise’s house. The water level is at the top of her garage — she needs a boat just to reach her house. Head north another 30-40 minutes to Goodlettsville and Hendersonville and you’ll find the houses of some of my students and faculty at the college where I teach that were destroyed due to the flood. Donate stuff. People lost everything. While you can’t replace possessions with sentimental value, you can give someone a shirt to wear or sneakers for their kids or towels or rags so they can clean the mud out of their bathtub. If you’re on Facebook, check out the clothing drive for middle TN residents at: http://www.facebook.com/?ref=home#!/event.php?eid=113883681985618&ref=ts or the cleaning supply drive at http://www.facebook.com/?ref=home#!/event.php?eid=111188545589696. Participate in clean up crews. If you live within driving distance and have the time or skills and want to help cleanup and rebuild, go to Hands-On-Nashville at http://www.hon.org. They need volunteers immediately. Los Angeles, CA (PRWEB) April 21, 2010 — Los Angeles actor, D.C. Douglas, says he was dropped from the upcoming GEICO “Shocking News” campaign after a group of Tea Party members harassed him and the insurance giant over a private voicemail the actor left for FreedomWorks. Matt Kibbe, President and CEO of FreedomWorks, posted Mr. Douglas’ cell phone number in a blog post on biggovernment.com, instructing readers to “Feel free to contact (him)… call his employer too. Let them know that you…are now in the market for car insurance.” The next day, GEICO held auditions to replace Mr. Douglas’ voice on the campaign. Mr. Douglas’ message hardly warranted the mobilization of the Tea Party Movement. Upset by the recent gay and racial slurs slung by Tea Party members at Congressman Barney Frank and Representative John Lewis during the Health Care Reform Weekend, Mr. Douglas left his opinion of FreedomWorks’ staff and followers on their company voicemail and included his phone number. Mr. Douglas consulted with several Los Angeles attorneys and has been advised that FreedomWorks’ actions were questionable. Though he’s not planning on spending money to sue the organization, he’s open to any attorneys taking on this case pro bono. “We can’t let these kinds of tactics become the norm in our country. If we do, then anybody can lose their job just for voicing an opinion.” And Mr. Douglas won’t be silenced; he has posted his personal take on the events on his blog: www.DCDouglasBlog.com. Actor Elmore “Rip” Torn…was arrested Friday evening after drunkenly breaking into a Connecticut bank while carrying a loaded revolver, according to a statement from police. Torn was charged with burglary in the 1st degree, criminal mischief in the 3rd degree, carrying a firearm while intoxicated, trespassing in the 1st degree and possession of a firearm without a permit, and is being held on a $100,000 bond. Torn has voiced characters in the animated feature films Bee Movie, Hercules and the upcoming Imagi Animation Studios’ Cat Tale. The character Jack Benny portrayed on his classic TV program and long-running radio show was a lovable miser — an infamous cheapskate whose extreme frugality was a running gag on the series. Who would ever have imagined that a half-century later CBS would reflect Benny’s TV persona by refusing to release masters of his classic program for the very same reason: they’re too danged cheap. CBS has shelved about 25 recently unearthed episodes of “The Jack Benny [Program]” — because it doesn’t want the hassle of paying for licensing, etc. The International Jack Benny Fan Club, with the blessing of the Benny estate, approached CBS and offered to pay for the digital transfer and preservation of the rare episodes. But, according to fan club president Laura Leff, CBS refused to let the episodes out of their vault — with a CBS exec citing unspecified “issues” thought to be potential musical copyrights, etc. and the costs associated with these elements. Leff says she believes the roughly 25 “Benny Show” tapes are in the public domain, since they’re over 28 years old and weren’t copyrighted. “We just want [CBS] to realize they shouldn’t be locking away our cultural heritage,” Leff said. The Jack Benny Program aired between 1950-65, and the popular weekly radio show that it spun off from was on the air for nearly 20 years prior to that. Both the radio show and TV program featured a number of guest stars from radio and film, including actors who’ve voiced characters in animation such as Frank Nelson, Bea Benaderet, Barry Gordon, Alan Soule, legendary ventriloquist Edgar Bergen and the late cartoon voice acting legend Mel Blanc. I’ve been a member of the International Jack Benny Fan Club for more than a decade, and I fully support the IJBFC and the Benny estate in their efforts to procure and preserve the heritage of a television classic like The Jack Benny Program. For those on Facebook, you can show your support by joining the group “Tell Les Moonves to preserve The Jack Benny Program Masters”. Further details and updates are available via JackBenny.org. Reuters reports that Mandy Moore has been cast as the voice of Rapunzel for Disney’s “Digital 3D-animated musical action-adventure” currently scheduled for a Holiday 2010 release. Rapunzel will be directed by Byron Howard (co-director of Bolt) and Nathan Greno (Bolt writer and story artist) with music by Alan Menken who scored such Disney animated features as Beauty & The Beast, Hercules, The Little Mermaid, Aladdin, Pocohantas, and Enchanted. In related news, Walt Disney Home Studios Entertainment has announced (via Video Business) that it is “expanding its high-end Blu-Ray Disc line, the Diamond Collection,” to include several of their animated classics: The Lion King, Bambi, Cinderella, The Little Mermaid, Peter Pan, Lady and the Tramp, The Jungle Book, 101 Dalmatians, Pinocchio, Fantasia, and Beauty and the Beast. Disney will release two Diamond Collection titles each year, beginning on 10.06.2009 with Snow White and the Seven Dwarfs. Fantasia and Beauty and the Beast are scheduled for release in 2010. Video Business adds that “each title will be packed with fresh bonus features and will be available for a limited time at retail.” One of the features to be included on Snow White will be a ‘Backstage Disney’ featurette, exploring Hyperion Studios where the film was produced in 1937.